Testosterone is available in many different preparations, esterified variants, and forms. This is where each will be described and covered. Almost every single injectable anabolic steroid, with the exception of a select couple, has undergone a process known as esterification. The process of esterification refers to a chemical reaction by which a carboxylic acid of varying length is chemically bonded to the anabolic steroid at the 17-beta hydroxyl group. This is known as esterification (or an ester bond), and the ester serves to extend the release rate and half-life of the hormone in the body. This occurs by way of enzymes breaking down the ester that is attached to the anabolic steroid. This occurs primarily in the liver, but also occurs in the bloodstream as well. The body must first break off the ester (by way of the enzymes previously mentioned) before the anabolic steroid hormone can be free in the body to do its job. By the time this occurs, the anabolic steroid has left the site of injection and is circulating systemically within the body. The result is that all anabolic steroids operate on a systemic basis according to the body’s needs, and not a localized site-specific basis. Testosterone suspension is an un-esterified form of Testosterone, for example, as it is simply pure un-esterified Testosterone suspended in crystals in water. In addition to these esterified variants, there also exists what are known as blends of Testosterone, which are preparations and products that contain a blend of the above mentioned esterified forms of Testosterone. For example, one of the most well-known blends is Sustanon 250, which contains a total of 250mg of Testosterone split into the following blend amounts: 30mg of Testosterone Propionate, 60mg of Testosterone Phenylpropionate, 60mg of Testosterone Isocaproate, and 100mg of Testosterone Decanoate for a total of 250mg worth of combined Testosterone esters (hence the number 250 in the name Sustanon 250). 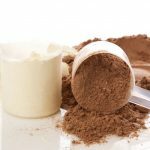 There exist other blend type products that contain other varying amounts, such as blends of 450mg of multiple Testosterone ester types, and so on and so forth. 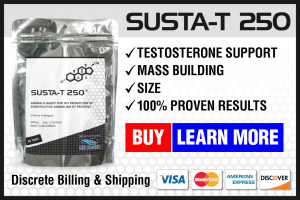 There also exists other less popular esterified forms of Testosterone, such as Testosterone Acetate and the others contained within the Sustanon 250 blend (Testosterone Decanoate, Testosterone Phenylpropionate, Testosterone Isocaproate, etc.) but for the purpose of this article, the three primary types listed above will be focused on and explained in detail. Testosterone Enanthate is perhaps the most popular and most widely used esterified variant of Testosterone. This is due in large part to its longer half-life and extended window of release, which allows for more convenient injection administration protocols. Testosterone Enanthate’s half-life is that of approximately 7 – 10 days, which allows for a convenient once or twice weekly injection protocol, unlike Testosterone Propionate which requires a once every other day injection protocol. Unesterified Testosterone, such as Testosterone suspension is even worse for those who are needle-shy or do not wish to engage in frequent injections due to the fact that it must be injected either more than once daily, or at the very least once daily. 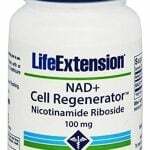 Because of the longer half-life, it is better suited for medical and TRT applications, but also well suited for performance enhancing use as well (for those who do not wish to engage in frequent injections, as previously mentioned). Testosterone Cypionate, although chemically different from Testosterone Enanthate, is considered almost the equivalent. It too possesses a similar half-life, although slightly longer (approximately 12 days for Testosterone Cypionate and approximately 10 days for Testosterone Enanthate). The other primary difference between the two is that of their origins – Testosterone Enanthate is primarily an international product with international origins, while Testosterone Cypionate is traditionally an American product. Both are very similar in terms of their half-lives, and hold almost equal popularity among anabolic steroid users with Testosterone Enanthate being the more popular of the two. The two esterified Testosterone variants are in fact so similar to one another that they can be easily interchanged within a cycle (for example, an individual on a 10 week Testosterone cycle could easily utilize Testosterone Enanthate for the first 5 weeks, and then for the remaining 5 weeks switch to Testosterone Cypionate with no problems what so ever). The conveniences with Testosterone Cypionate is the same as any other long-estered compound (such as Testosterone Enanthate), which is ease and convenience of more infrequent administration. Testosterone Propionate lands itself as the third most popular of the three major types of Testosterone esters despite the fact that it was the very first esterified form of Testosterone to be created. 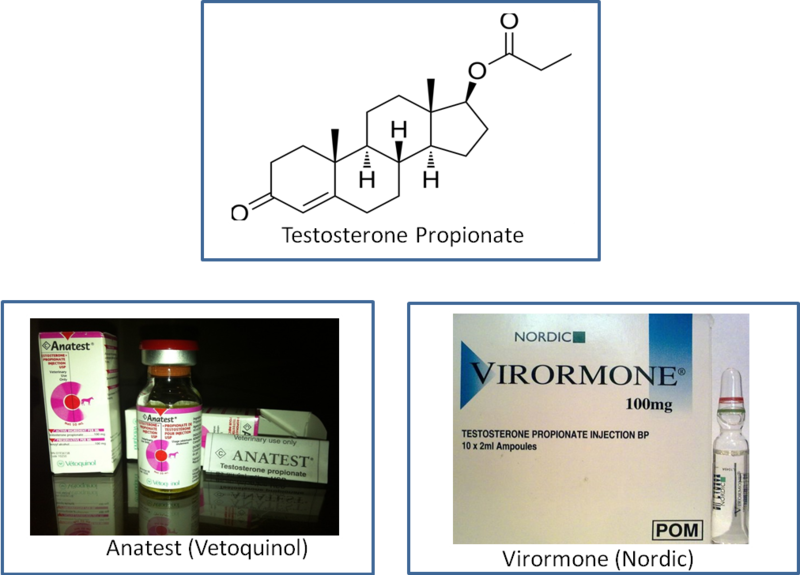 The Propionate ester extends Testosterone’s half-life in the body to approximately 4.5 days, which is much shorter than the previous two discussed esterified variants of Testosterone. Therefore, maintaining stable blood plasma levels of the hormone requires a significantly more frequent injection and administration protocol (at least every other day injections) than the other ester types, making it less popular among the majority of individuals who prefer less frequent injections. Nevertheless, this is not to say that Testosterone Propionateis an unpopular anabolic steroid – on the contrary, it is very popular and caters to a niche group of anabolic steroid users that prefer it among the others. It just so happens to be that due to the uncomfortable and inconvenient injections and administration schedule, Testosterone Propionate is merely the least popular of the three. It is very important to understand the importance of maintaining what is known as a stable blood plasma level of the hormone so as to ensure proper optimal gains, optimal physiological function, and less incidence of side effects. Although many anabolic steroids are esterified, which lends to an extended release and half-life of the hormone, the esterification still does not provide a completely steady stable rise and maintenance of peak blood levels. Even the long estered Testosterone variants, such as Testosterone Enanthate, Testosterone Cypionate, Testosterone Decanoate, etc. will release the hormone quite quickly from the injection site following administration, and through the enzymatic removal of the ester, it will cause a fairly sharp spike in blood plasma levels of Testosterone considering the total half-life of the long esters. This is very important to understand in regards to proper dosing and administration scheduling, as the maintenance of proper steady and stable peak optimal blood levels of the hormone is essential to proper functioning. Blood levels of almost any ester type will peak approximately 48 hours following injection. This also means that despite any misinformation that might be circulating about how longer estered Testosterone variants ‘take longer to work’, when these compounds are in fact working very soon following injection administration. The difference that these esters will make is the time required to achieve a steady state blood plasma levels that are optimal, which is generally achieved over the long term with the longer esters such as Cypionate and Enanthate. The ‘life span’ of the hormone that is esterified (in this case, Testosterone) will be increased by the ester due to the time required for enzymes to free the hormone from the ester that it is bound to. A small portion of an esterified anabolic steroid’s rate of release has also to do with the solubility in fats that the ester itself causes, although this is not as significant of an influence on half-lives as the process of enzymatic breakdown of the ester itself. Esters are, for the most part, long-chain hydrocarbons which classifies them as fats, making them lipophilic (fat soluble), and thereby making whatever compound they are chemically bound to also lipophilic (in this case, Testosterone). Being that Testosterone and all anabolic steroids are already forms of lipids (fats), the addition of an ester will increase the hormone’s solubility in oil and fats. Following an injection, the oil that contains the hormone will form what is called a depot (deposit) within the muscle tissue, and the hormone will slowly move away from the oil to which it is lipophilic, and into circulation in the bloodstream. It stands to reason then that the longer the hydrocarbon chain of the ester in question, the more fat soluble a hormone will be, and therefore this will contribute to the extended release of the hormone. This is the reason as to why anabolic steroids with an extremely long ester chain, such as Deca-Durabolin (Nandrolone Decanoate) hold such a long half-life and are known to even remain in fatty tissues in the body for months after administration has ceased. Once the hormone has released from the injection site into bloodstream circulation, enzymes, as mentioned many times already, will work to break the ester away from the hormone. It is very important to note to the reader that while the hormone remains bound to the ester, the anabolic steroid hormone is inactive and cannot perform any of its jobs until the ester has been removed. Considering the half-life of the various types of Testosterone esters, there are different protocols among them that must be considered in order to achieve stable blood plasma levels. There is also a difference between those individuals looking to use Testosterone for the purpose of performance and physique enhancement, and those looking to use it for the purpose of TRT. It should be outlined very first that the use of Testosterone of any ester type for TRT allows a far more lenient and lax injection protocol than for the purpose of performance enhancement. This is because the overall goal of TRT is that of maintaining normal physiological Testosterone levels and proper normal physiological function. Testosterone Enanthate (TRT): Administration (injection) once every 2 – 4 weeks. Testosterone Cypionate (TRT): Administration (injection) once every 2 – 4 weeks. Testosterone Propionate (TRT): Administration (injection) 2 – 3 times per week (average of Monday/Friday or Monday/Wednesday/Friday injection protocol). Sustanon 250 or any Testosterone blends (TRT): Administration (injection) once every 3 weeks. Note that the injection protocols and frequency for the purpose of TRT is never set in stone, and can always be adjusted according to the patient’s discussion and decision with their doctor. Often times many doctors will settle on an injection frequency with their patients of a once weekly injection for Testosterone Enanthate or Cypionate, for example. Many medical professionals have believed that the injection protocols as outlined by medical prescription guidelines require revision so as to ensure more frequent injection protocols in order to achieve more stable blood levels, but nevertheless, medical prescription guidelines remain as listed above. The general idea here, however, is to emphasize the fact that injection frequency can always be adjusted according to the individual’s needs, and especially following monitoring with blood work. 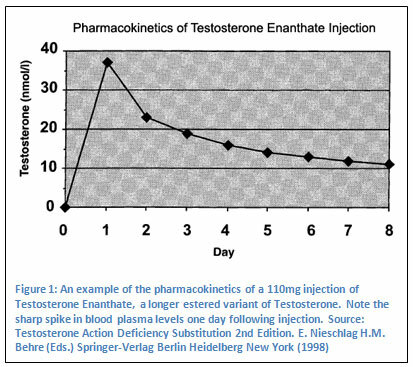 Testosterone Enanthate (performance enhancement): Administration (injection) twice weekly with each injection spaced evenly apart (example: Monday and Thursday injections). Testosterone Cypionate (performance enhancement): Administration (injection) twice weekly with each injection spaced evenly apart (example: Monday and Thursday injections). Testosterone Propionate (performance enhancement): Administration (injection) once every other day. Sustanon 250 or any Testosterone blends (performance enhancement): Administration (injection) once every 7 – 10 days with some protocols even calling for once every 3 days. Although the longer estered Testosterone variants such as Cypionate and Enanthate hold longer half-lives of approximately 10 – 12 days, it is imperative that for the purpose of physique and performance enhancement they are administered at least once weekly, with the optimal being twice weekly spaced evenly apart. Although one may be able to ‘make-do’ with single weekly injections, this is not recommended due to unstable blood levels producing a greater incidence of side effects and less than desirable effects on progress and gains. Blended products such as Sustanon 250 are a complex and interesting topic, as Sustanon 250 presents disadvantages to the athlete and bodybuilder in comparison to other single Testosterone ester type has been defined several times already. This disadvantage is due in large part to the fact that there is very little control over the varying release rates of the different Testosterone esters within the Sustanon 250 blend. Therefore, any user willing to utilize Sustanon 250 (or any type of blended Testosterone product) will find they are disposed to having far less control and management of half-lives, and proper dosing. Nevertheless, for the purpose of physique and performance enhancement, Sustanon 250 doses must be administered approximately every 7 – 10 days instead of the medical guidelines of once every three weeks. Some have even favored administration of Sustanon 250 doses once every 3 days, as the reasoning behind this is that of the use of short-estered Testosterone variants in the blend. If any product is a blended product (whether it is Sustanon 250 or any other underground lab type of custom blend), the one ester type within the blend to determine the administration protocol off of should always be: 1. the ester type within the product that consists of the largest amount compared to all others, and, 2. The shortest ester type (if it comprises the largest concentration among all others in the blend). Testosterone is an extremely popular and very common anabolic steroid on the market, both within medicine as well as on the anabolic steroid black market across the globe. The majority of individuals utilizing Testosterone for the purpose of physique and performance enhancement will normally elect to purchase anabolic steroids through the black market, which could result in pharmaceutical grade product as well as underground lab (UGL) product. 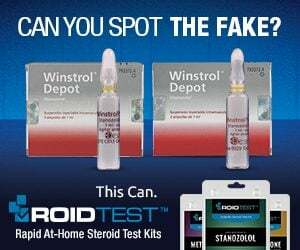 The fact is, however, the majority of Testosterone (or any anabolic steroid) product on the black market is in fact UGL quality. Although pharmaceutical grade products can also be purchased from the black market, the risk of fake counterfeit pharmaceutical products is extremely high. This is unfortunately due to the legal circumstances surrounding anabolic steroids in the west, which has created a global environment in which today, in 2013, the number of pharmaceutical grade product on the anabolic steroid black market remains at approximately 20%, with 80% of the market saturated with illegitimate non-pharmaceutical product (UGL grade) and counterfeits. Although the majority of UGL products are utilized by those looking to use them for performance enhancing purposes, there are also individuals who will take it upon themselves to self-administer TRT and do this through purchasing UGL grade Testosterone rather than doing this through a doctor and obtaining their Testosterone product through the pharmacy. Pharmaceutical grade: These are pharmaceutical products contrived and promoted by FDA (or any equivalent association) approved pharmaceutical corporations. The products resultant from these corporations is of very high quality, precisely dosed, definite sterility, and purity. This is due to the immense amount of oversight tight quality control by the FDA (or any similar international organization). The disadvantage to such high quality products is, of course higher product cost due to the manufacturing expenses and the expenses often required for covering R&D. Underground lab (UGL) grade: Underground labs are laboratories that established (often illegally, depending on which country) to produce anabolic steroids. 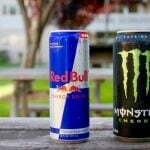 They are inspected, overseen, or approved by the FDA (or any equivalent organization). 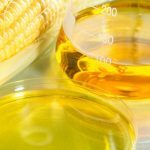 The manufacturing conditions run by these laboratories can range from pharmaceutical grade facilities to home based laboratories established in a house basement, which would then translate to wildly varying ranges of quality in the products (due to no FDA or similar oversight and quality control). The benefit to UGL grade products is, of course, the lower cost of product in comparison to pharmaceutical grade anabolic steroids. The cost differences between pharmaceutical and UGL Testosterone can be quite strikingly different. 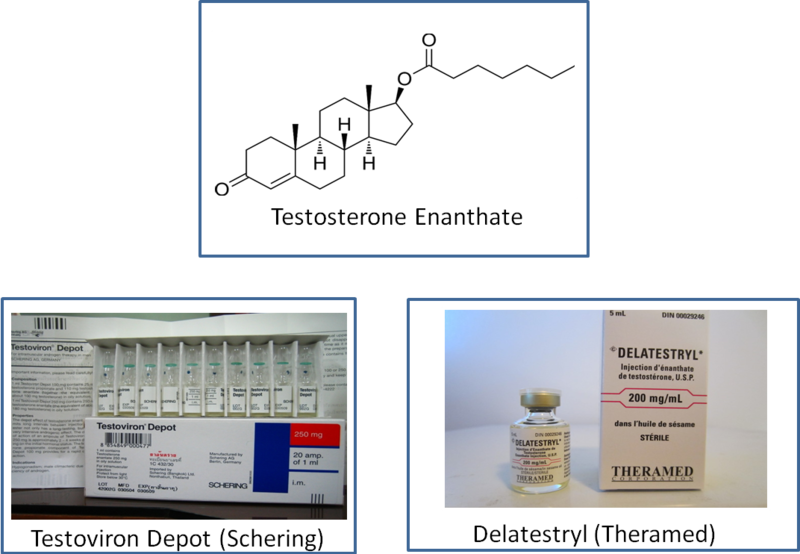 However, Testosterone is one of the more cheaper anabolic steroids to manufacture and sell to begin with, and so price differences between UGL and pharmaceutical grade products might not be as stark as other more rare and/or typically higher priced anabolic steroids, such as Anavar (Oxandrolone) or Primobolan (Methenolone). Pharmaceutical Testosterone Enanthate will commonly be seen being sold for approximately $13 – $15 for a single 1ml vial containing 250mg/ml (pharmaceutical grade glass ampoule products). Underground product in comparison would land in the range of $60 – $90 for a single 10ml vial containing 250mg/ml. If one were to break down the price per mg of each grade and compare, it would turn out to be $0.052 – $0.06 per mg of pharmaceutical grade Testosterone Enanthate versus $0.024 – 0.036 per mg of UGL grade Testosterone Enanthate. 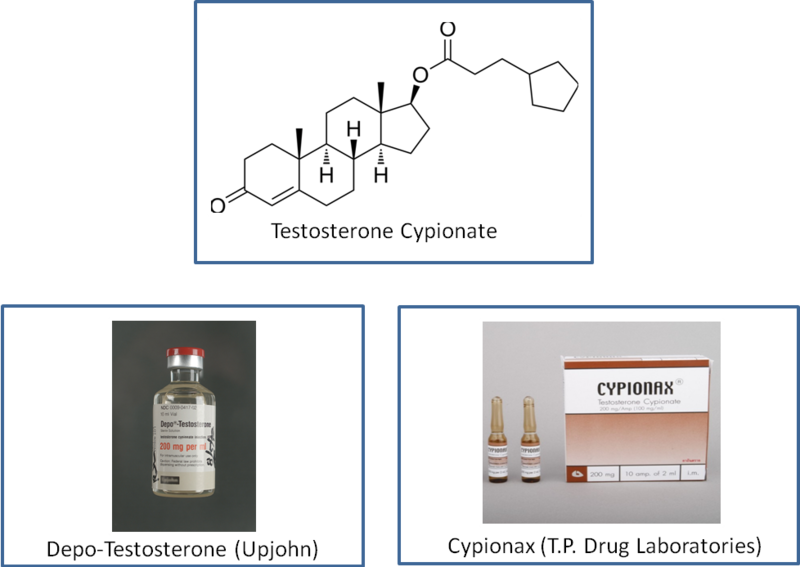 Pharmaceutical grade Testosterone Cypionate will typically be priced in the range of $15 – $18 for a single 1ml ampoule containing 250mg/ml, and, for UGL grade, $60 – $90 for a 10ml vial dosed at 250mg/ml. The difference on a price per mg basis is that of $0.06 – $0.072 per mg for pharmaceutical grade, and $0.024 – 0.036 per mg of UGL grade (generally the exact same as Testosterone Cypionate due to the very similar nature of the two compounds). Testosterone Propionate as pharmaceutical grade will sell for approximately $4 – $6 per single 1ml vial containing 50mg/ml. Underground product typically lands in the range of $45 – $65 for a single 10ml vial containing 100mg/ml. Price differences on a price per mg basis here can be laid out as $0.08 – $0.12 per mg for pharmaceutical grade, and $0.045 – $0.065 per mg for UGL grade. Pharmaceutical grade Sustanon 250 can be found priced for approximately $6 – $15 per 1ml ampoule containing 250mg. Underground lab prices will usually be found in the range of $50 – $100 for a 10ml vial containing 250mg/ml of product. All products obviously depend on the lab in question that is manufacturing the product, and this must always be kept in mind. Price differences on a price per mg basis here can be laid out as $0.024 – $0.06 per mg for pharmaceutical grade, and $0.02 – $0.04 per mg for UGL grade. The last Testosterone variant and product to be discussed are the Testosterone creams and gels for the purpose of TRT. These are properly known as transdermal patches, gels, and creams that utilize the transdermal method of administration as opposed to the oral or injection routes of administration. Transdermal administration is a route of administration whereby the active ingredients contained within the cream, gel, or patch will cross through the skin by entering the pores, and enter the bloodstream to enter circulation through this method. Although there are a few advantages to transdermal methods of administration, there exist various disadvantages as well. Because TRT is a method of therapy that requires the consistent administration of Testosterone daily or weekly (depending on the route of administration), there is a manner of convenience to this method of administration for individuals that do not wish to resort to injections for whichever reason they choose. However, transdermal administration of Testoserone tends to be associated with the potential of experiencing far more disadvantages than advantages. Advantages of transdermal administration: The advantages lay mostly in convenience, as a simple topical rub on of a certain amount of the gel or cream (or application of a patch) daily is all that is required for administration. Disadvantages of transdermal administration: There exist numerous concerns and disadvantages when transdermal administration of creams and gels are concerned. The first and foremost issue of concern is the problem of skin-to-skin contact with the individual who is utilizing the topical gel or cream, which can often result in the transference of Testosterone from the TRT patient to the other individual. This can pose problems involving contact with the TRT patient’s wife or girlfriend, or close contact involving children and babies. The risks that might arise from this transference can involve unexpected signs of pubertal development in children, and virilization in women who have been in physical contact with the patient using TRT gels/creams. Skin-to-skin contact is not the only possible method of transference, as unwashed clothing, bed sheets, pillows, etc. can also contain remnants of the substance if it has come into contact with areas of the body that the topical gel or cream has been rubbed on to. Although most Testosterone gels are designed for rapid absorption into the skin whereby the area applied will dry fairly quickly, there is still an inherent risk of transference involved. The other concern involving transdermal administration is the issue regarding increased rates of aromatization into Estrogen of the Testosterone being applied. Clinical studies have demonstrated that a higher body fat percentage will present a higher risk of Estrogenic side effects. This is because the aromatase enzyme is highly abundant in adipose tissue (fat), and so it stands to reason that the higher an individual’s body fat percentage is, the greater the rate of aromatization of androgens into Estrogen will result. If Testosterone is being applied topically to be absorbed dermally (through the skin), it must pass through sub-dermal fat tissue where it can be prone to increased rates of aromatization. 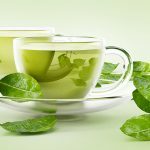 With this having been said, Testosterone gels and creams have been proven in studies to be just as effective as many other forms of administration of Testosterone. In these studies, transdermal Testosterone applications have effectively increased sexual function, mood, lean mass, and bone mineral density in hypogonadal patients. It is important to note that the same potential for side effects and risks exists with transdermal Testosterone application as they do with any other method of Testosterone administration. The two primary brands and forms of transdermal Testosterone products available are AndroGel (sold as a 1% or a higher concentration 1.62%), and Testim 1%. AndroGel is by far the most widely utilized and most popular topically applied Testosterone gel product for the purpose of TRT application. AndroGel is manufactured by Besins Iscovesco in Paris, France and is marketed and supplied by Solvay Pharmaceuticals. AndroGel consists of 1% Testosterone, which is the equivalent of 10mg per gram of gel, and studies have demonstrated that 10g of gel applied topically to the skin results in the equivalent of 100mg of Testosterone administered into the body . The price of AndroGel 1% can range from $200 – $300 for a single 75g gel pump bottle, which would, depending on the prescribed dose used, last the individual for approximately one month. The higher concentration AndroGel 1.62% can range from $350 – $425 for a single 75g gel pump bottle. Although at first there existed no generic brands of Testosterone gels, in recent years there have been some generic products developed by compounding pharmacies that is reported to cost less than half of the price of brand name AndroGel. It is reportedly difficult and rare to find, but is becoming popular.